Freesias are a fragrant spring flowering bulb. 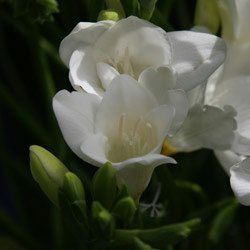 Although small the freesia bulb with wonderful flowers, the great thing about freesias is that the flowers are magnificent as well as that fragrance. Giant, taller growing and larger flowers. Originally from South Africa and require a well drained soil and with around 15 species the modern hybrids are all the result of intensive hybridisation. As they are from a winter rainfall area they are well suited to Australian conditions. Freesias look great in a massed planting and flowering season is in spring. Look for giant freesias for a huge impact. Freesias prefer a humus rich well drained soil and do not like frosts. They grow well in pots and prefer to be protected from excessive heat. Plant at around 5cm deep, they will reach a height of 20 – 30 cm. For good display plant 3 – 5 cm apart. Easy to grow in a cool to temperate climate and will quickly form a clump in the garden. Freesias can be grown in pots or indoors if required. A sunny position and a humus rich moist but well drained soil is ideal for growing freesia bulbs. Best planted in large drifts in the garden for a great display. Well drained soil in the garden or containers, do not over water freesias. Freesia bulbs do not need to be lifted each year, leave them in the ground and they will come back well each year. Divide freesias every three years as clumps become crowded. Freesias are named after Frederick Freese, a 19th century German physician. Imperial Giant Freesias are a tall growing variety, great for cut flowers. Double freesias look great when planted in clumps. Plant freesia in late summer early autumn. 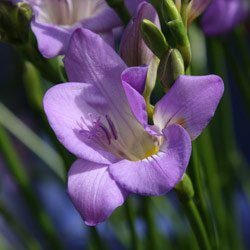 Generally not available for sale in Australia, Freesia species can be grown from seed sourced overseas.